Well…Barack HUSSEIN Obama is ‘aiding and abetting’ the enemy yet again as this time he’s giving another $148 million of our taxpayer dollars to what he calls ‘Palestine’…which is quite odd as there is NO country called ‘Palestine’. Obama really needs some geography lessons, but what can you expect from the man who thinks there are 57 states in the Union. But hey, there are 57 islamic states in the Organization of Islamic Cooperation…the so-called ‘collective voice of the muslim world’…so I guess that was easy for him to confuse with US states, and was what he meant when he said he visited all 57 states (said sarcastically with eyes rolling upward). Clarifying his words by saying that the money will actually go to support the Palestinian Authority’s government of Mahmoud Abbas (translation: just another band of terrorists) so they can address the ‘supposed’ critical economic and humanitarian hardships facing the Palestinian Authority and the so-called (but non-existent) Palestinian people is quite ambiguous at best for it seems all the monies we give them usually end up going into securing guns, weapons, and rockets to use against Israel. But Obama still bloviates that ‘US national security interests’ are the reason for his new decision to send them even more monies, and with that as his excuse Obama gave Secretary of State John ‘Swiftboat’ Kerry authorization to issue a waiver on the restriction of funds Congress put in place after the Palestinian Authority submitted its unilateral bid for United Nations membership last September. But, I’d really like to know what ‘national security issues’ the Palestinian Authority poses to the United States of America and I bet you would too. And then Obama added to this slap in the face to Israel…for that is what aiding the Palestinian Authority is…by further stating that this was done to avert ‘a budget crisis’ and to promote the peace process, because according to ‘Obama-logic’ sending so-called aid is supporting US efforts to achieve a two-state solution to the Israeli-Palestinian conflict. But in reality what Obama is actually doing is once again funding a terrorist organization…the muslim version of what I call ‘sponges’ because they have always counted on foreign aid to subsist…and the cowards in Congress are letting him get away with it . 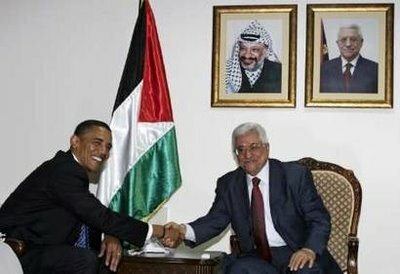 And in case you didn’t know, since 1994, the US has given the Palestinian Authority $1.3 billion in aid, and this is NOT the first time that Obama ordered a waiver of congressional restrictions for his muslim brethren for just this past March Obama gave $500 million to them by bypassing the very same Congressional restrictions. And even with all this monetary aid coming into the Palestinian Authority’s hands supposedly to work for peace and the betterment of its people they’re still at war with Israel…still trying to lay claim to Jerusalem…and still aligning themselves with other terrorist groups like Hamas and the Muslim Brotherhood…Obama’s blood brethren and I guess that spells out the truth as to why he keeps sending them aid…shades of Egypt for sure. And with an Obama spokesman saying that, “Direct budget support to the Palestinian Authority is the most immediate and efficient means of helping the Palestinian Authority maintain and build the foundations of a viable, peaceful Palestinian state” what is NOT being said is that the Palestinian Authority does NOT want peace with Israel…they want Israel, period. So to that end this past Friday, Palestinian Prime Minister Rami el-Hamdallah signed a financial support agreement for an “$148 million aid transfer from the US administration to Palestine” and he signed it with US Consul General Michael Ratni…and signed it somewhere in the non-existent country of Palestine. And once again Israel feels the knife digging deeper into her back put there by the same man who sides with the enemy in Egypt…the same man who has the blood of Benghazi on his hands…and the same man who wishes that Israel would become the 58th islamic state. And we all know who that man is…Barack HUSSEIN Obama…for sometimes a middle name does indeed say it all. i think its to Israel to stop war and phalsteane. all the wars in the world must stop now……..